The subject of Fake News (as Ron Matsen discussed in the January 2017 Personal Update) has been in the headlines over the last few months as though it’s some newly discovered phenomenon. Fake news and reports have been around for thousands of years, and many of us get caught out from time to time with fake news, but what about fake images? Isn’t seeing believing? Images and videos are usually regarded as the most concrete, honest evidence of experiences and events we cannot witness ourselves. This is often the case in court, in the news, in scientific research, and in our daily lives. Words, we know, can lie. But that trust makes it all the more shocking — and serious — when images lie to us, too. Intent is the meaning behind what you do. If a man takes a sharp knife and cuts someone, it’s not the act that is necessarily good or bad — it’s the intent. A good intent maybe a doctor using this sharp knife to save a life; the bad intent is the attacker wishing to inflict bodily harm. Intent behind the creation of a fake image is all the more important. Images can encourage, entertain, horrify or vilify to name a few. It is always important to remember that an image is a snapshot of time. With only a photograph as reference, there is no way of knowing the details of what lies outside of the photograph. This is implied, assumed or garnered from external supporting sources. Objectivity when looking at a photograph is virtually impossible. Everyone has a context in which they see the world, our current emotional state, whether we had a good sleep last night or even how our day is going, and this can influence how we read and interpret images. Our interpretation can be further influenced by an image caption or accompanying text, whether it be factual or false. Believe it or not, there are actually people that seemingly have way too much time on their hands with seemingly nothing else better to do than to go through Dr. Chuck Missler’s videos frame-by-frame, hoping to catch a compromising expression or hand gesture. Only to post it on Social Media with a headline “Look, Chuck Missler’s a Freemason!” or “Chuck’s a Satanist.” I have often used the phrase, “That smacks of effort.” They’re essentially saying that Chuck spends years of Bible study and tens of thousands of dollars to produce a 24 hour Bible Commentary in the hopes that he can slip in a single frame hand-gesture to turn everyone into Satanists? That smacks of effort! As the production crew in post editing, we do our best to edit out Chuck’s slip-ups, sneezes, drinks of water etc., but it’s essentially a live recording. A single take, for the most part, in front of a small live audience. It’s not an old-school animation in which every frame is hand drawn and everything in that frame is there by design. Whenever you film anyone, and they have something in their eye for example, and use the wrong finger to scratch it away and BOOM! “In video frame x he was flipping the bird,” but was there any real intent behind it? No, these people already have a certain viewpoint and a desire to attack Chuck’s credibility. So they will go to extraordinary lengths to try and do just that. I think those people perhaps should just watch the video at normal speed and potentially learn something. Misrepresented, manipulated, or fabricated images can do serious damage to our sense of the past. 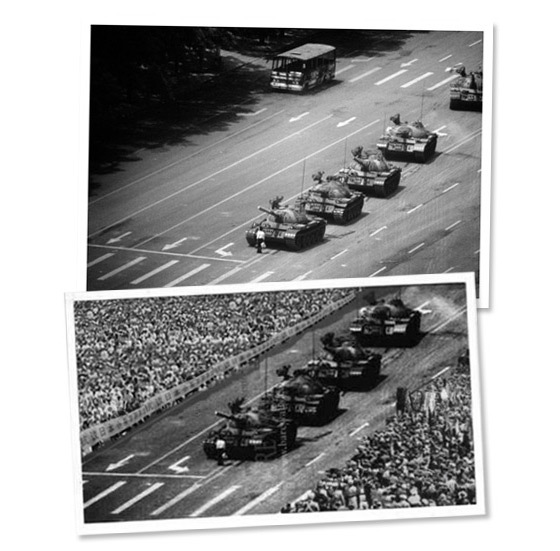 Take, for instance, a 2007 paper titled “Changing history: doctored photographs affect memory for past public events.” The researchers showed participants, young and old, either an original or a doctored photograph of the 1989 Tiananmen Square protests in Beijing or a 2003 protest in Rome against the war in Iraq. The manipulated images distorted the memories of the pictured events for those who saw them. They “remembered” the Tiananmen Square protests as being larger, and protests in Rome as being more violent — more property damage and injuries — than those who saw the unaltered images. The ones exposed to the doctored images even indicated they would be less likely to participate in protests in the future. Top: An unknown Beijing citizen who would come to be known as “Tank Man” stands in front of tanks	on the Avenue of Eternal Peace on June 5, 1989, as military clashed with protesters in Tiananmen Square. Bottom: Fake image made to depict protests as being larger. But fake images have been around for a while, long before digital technology and Photoshop. Compositing is probably the most common. Compositing is taking multiple images or exposures and combining them to make a single image. Take this 150-year-old portrait of U.S. President Abraham Lincoln (below), in which he looks every bit the all-American hero. All is not as it appears — as although it is undoubtedly the 16th Commander in Chief’s face staring at the camera, the body in fact belongs to a prominent southern politician. 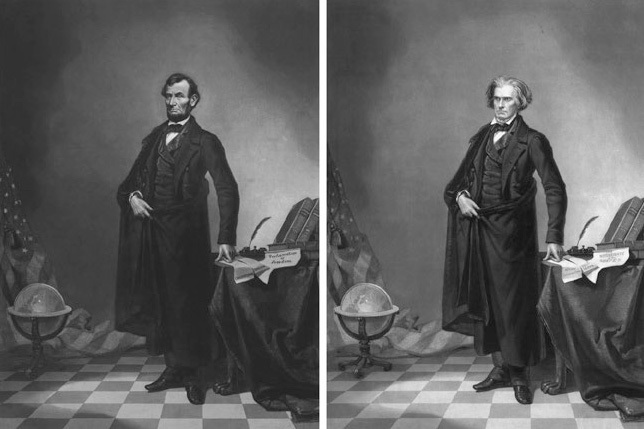 It has led to claims the 1860 portrait, stitched together from two pictures as “no sufficiently heroic portrait of Lincoln had yet been taken”. Other interesting images from down the years show how the art of photographic trickery has developed over time. Fake: The photo on the left appears to be of General Ulysses S Grant in front of his troops at City Point, Virginia, during the American Civil War. It is in fact created from three pictures, the head from a portrait of Grant; the horse and body from Major General Alexander M McCook; and the background of Confederate prisoners captured. 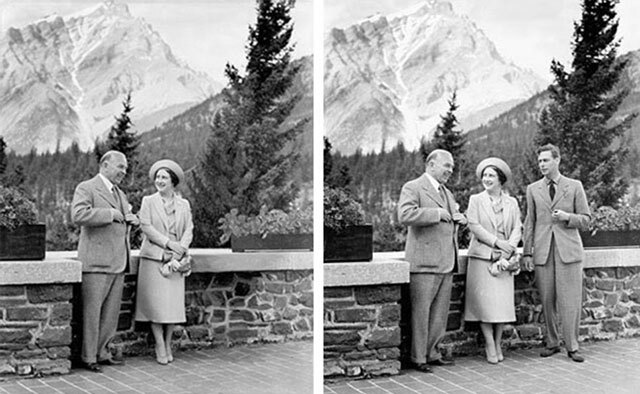 Regal doctoring: King George VI was removed from the original photograph of himself, Queen Elizabeth and Canadian Prime Minister William Lyon Mackenzie King in Banff, Alberta, because, it is believed, the PM wanted to paint himself in a more powerful light. This type of editing is very commonplace today in publishing and advertising, and not just fashion magazines. When I was employed as an artworker at a design company in Wellington, New Zealand, one of my tasks was to take concepts from the designers and make it a finished work. This often consisted of hiring models, a photographic crew and venue. Then we would select the best photos from that shoot and composite a piece over several days suitable for publication. Another example, we would be publishing an annual report for a large company that would require a group photo of the board members. Trying to get all the members in for a photo shoot at the same time proved to be difficult. So, we would photograph them around their regular schedules, individually or in several smaller groups. I would then construct a single composite image for publishing. If I did my job right, you should not be able to tell it was a composite. Now I work for K-House, that whole process is very expensive and time-consuming. So, we discuss ideas, and I usually then peruse stock image sites (if we can’t take photos, or fully create the image ourselves) purchase a license for a couple of images (maybe $6–$30) and then proceed to composite the desired image over a day or two. There’s no malicious intent. When you’re dealing with ancient or supernatural themes, sometimes there’s just no photographs in existence. 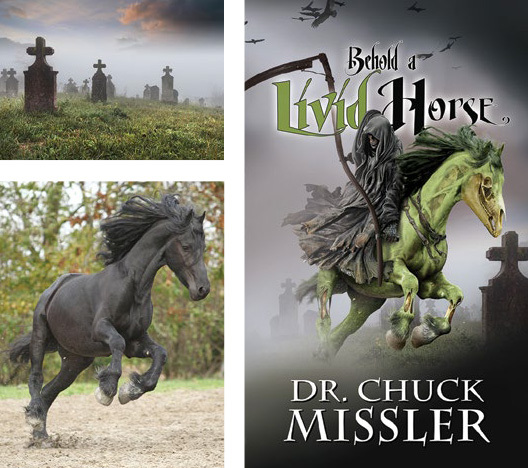 Behold a Livid Horse briefing pack cover by Dean Packwood. Some source images (left) and final composite image (right). With photorealistic and hyperrealistic painting and drawing skills, artists can also completely create photorealistic representations that cannot be easily distinguished from real life. From left to right: Sir Ian McKellen by Joongwon Charles Jeong (South Korea), acrylic paint on canvas. Old Man by Dean Packwood (New Zealand), digital painting. An elderly man by Olga Larionova (Russia), pencil. In staging an image or scene for a movie, it can be prohibitively expensive to have physical sets, so a chroma keying will often be used. This process includes live action filmed or photographed in front of a Green or Blue screen that can be easily selected and removed in post-production making it possible to add different backgrounds. Done well, and you would not be able to tell. Left: From the movie The Chronicles of Narnia . Right: From the movie The Monuments Men . Photos from Moving Picture Company. In fact, many news-rooms, weather channels, and sports feeds use live compositing techniques. Some news-rooms are “Virtual Studios” consisting of nothing more than a desk and the presenters, the background is digitally composited. Sports feeds can add in field lines or even billboard advertising to the original footage. Example of set used for a virtual studio using green screen. Background will be added in digitally. Let’s now go beyond some of the practical necessities for creating images (discussed earlier) and look at some examples of misrepresentation or even a more sinister agenda behind image creations. 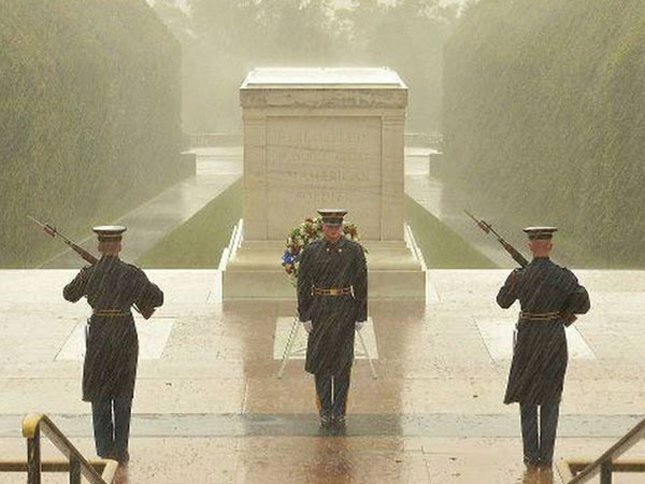 During hurricane Sandy this photo (below) was being spread on Twitter. The image was accurate in that it did show soldiers at the Tomb. But it had been taken a month earlier, not during Sandy. The picture had been posted on the Facebook page of the First Army Division East. In 2016, protesters turned violent against Trump supporters at a rally in San Jose. And the conservative media had been posting photos of people injured in the clashes. Some photos, however, aren’t actually from the protests. 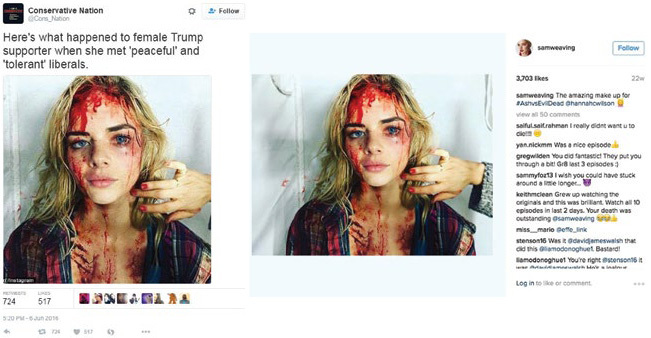 The Twitter account Cons_Nation posted a photo (below left) claiming, “Here’s what happened to female Trump supporter when she met ‘peaceful’ and ‘tolerant’ liberals.” But it’s not from the protests at all. The photo is real, but actually shows Samara Weaving, an Australian actress from the series Ash vs. Evil Dead . The “blood” is makeup, photos of which she posted to her Instagram back in January 2016 (below right). A digital composite of a British soldier in Basra, gesturing to Iraqi civilians urging them to seek cover, appeared on the front page of the Los Angeles Times shortly after the U.S. led invasion of Iraq. Brian Walski, a staff photographer for the Los Angeles Times and a 30-year veteran of the news business, was fired after his editors discovered that he had combined two of his photographs to “improve” the composition. 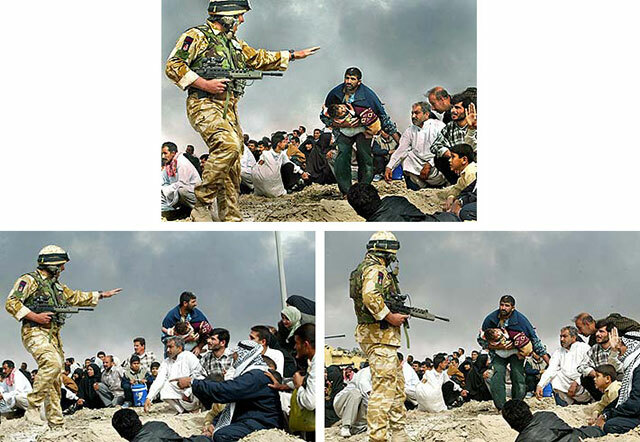 A digital composite (top) and source images (bottom) of a British soldier in Basra composited by Brian Walski, a staff photographer for the Los Angeles Times. Mark Twain once said, “If you don’t read the newspaper, you are uninformed. If you do read the newspaper, you are misinformed.” Some may think this is quite harmless; however, once it’s revealed that the photos are fake or misrepresented, you naturally start to have doubts the event actually took place and doubt the credibility of its source. There’s a lot of discussion about the Moon Landings and fake images. That’s a larger discussion, but some of the photos we see on the web may be real, some retouched and some fake. I could create a fake moon landing image, but because you may discover errors and that it’s a fake, that does not prove the event never took place. On December 24, 1968, the astronauts of Apollo 8 took a gorgeous shot of the “earth rise” as came from the dark side of the moon. It was the first photo of our planet from the perspective of another planetary body. Although a color photo was taken moments later, In 2013 NASA produced a computer-generated re-creation of the first photo, in full color. But ever since, people have been passing the re-creation around as an authentic photo. Left: Computer generated image, 2013. Middle: Original first photo taken in black and white, 1968. Right: Color photo taken moments after the 1968 photo. It is believed that this doctored photograph (below) contributed to Senator Millard Tydings’ electoral defeat in 1950. 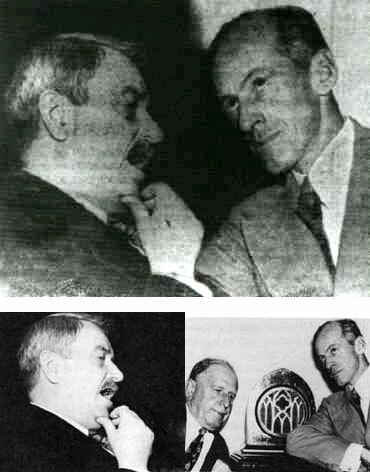 The photo of Tydings (below left) conversing with Earl Browder (below right), a leader of the American Communist party, was meant to suggest that Tydings had communist sympathies. A 1993 photo showing what appears to be an Israeli boy and a Palestinian boy overlooking Jerusalem with their arms around each other is one of the best-known photographs from the Israeli-Palestinian conflict. 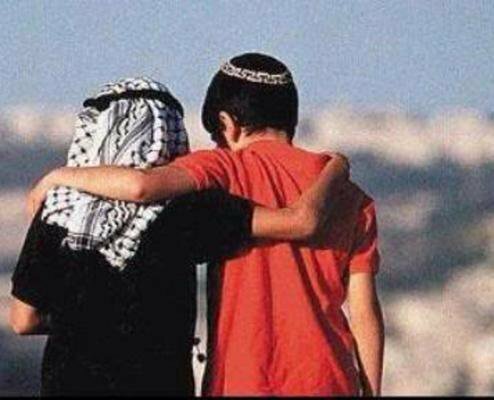 Tweeted by Rihanna in 2014 — and re-tweeted over 40,000 times — the photograph seemed to exemplify hopes for coexistence and peace in the region. But Rihanna was likely unaware that the photo was staged. American photojournalist Ricki Rosen who took the photo for a story on the Oslo Peace process, told The Forward “it was a symbolic illustration” and was never intended to be a documentary photo. A photograph apparently taken by a man pursued by the Israeli Defence Force (IDF) is revealed to be stunt by Israeli-Arab rapper Tamer Nafar from the band DAM — but that does not prevent it sweeping the internet. In reality, the IDF soldiers chasing the man are two actors and was taken on a film set that’s based on a true story. This was clarified later on Twitter but the clarification post was much less popular. 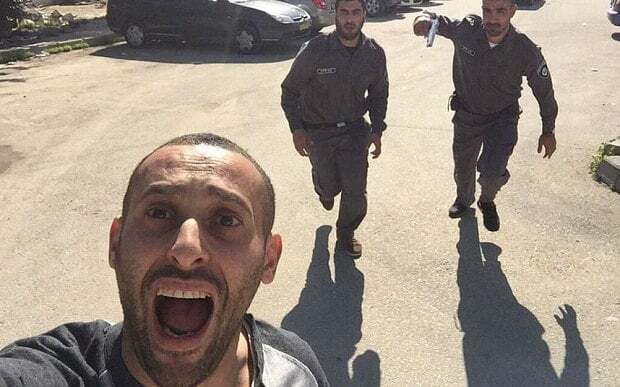 Staged photo: Israeli-Arab rapper Tamer Nafar, from the band DAM, pursued by actors posing as IDF soldiers. 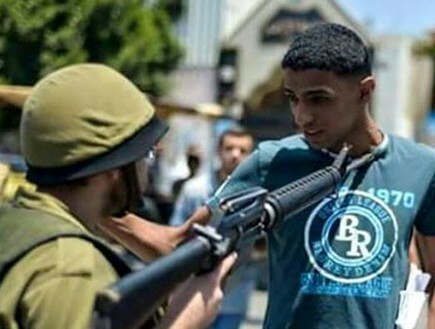 Another photo circulating on Facebook that purports to show an IDF soldier aiming his rifle at the neck of a Palestinian youth is apparently staged, Israeli Channel 2 news reported. Facebook photo purporting to show an IDF soldier aiming his rifle at the neck of a Palestinian youth, was proved to be staged. 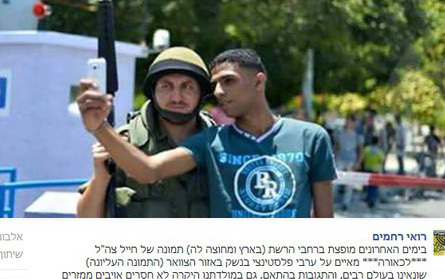 According to the report, both the “Israeli soldier” and the “Palestinian youth” in the image are actors, and a follow up-picture, discovered by websurfer Roi Rahmani shows the pair standing together for a selfie shortly after the initial photo. Rahmani, who posted the photo and its explanation on Facebook explained that it “was taken by actors, and their goal was to present the soldiers of the IDF in a negative light.” But the fake image posted on social media this week went viral within minutes, notching up over 15,000 re-tweets within 24 hours. The two actors pose for a selfie after staging a scene of Israeli brutality – Facebook photo. How many sites have we seen with accusations presented with supporting ‘screen grabs’ of tweets, posts, webpages or emails as proof? To determine a fake from an authentic can be virtually impossible if you don’t have access to the original source. These screen grabs can be easily faked. 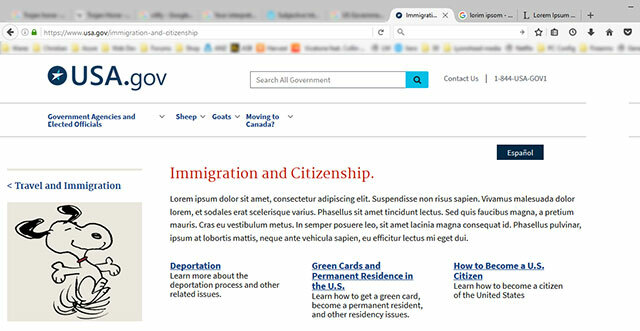 Here is a screen grab of the USA.gov website. The website was not hacked in any way, but the screen grab was edited on my computer with some alterations I made in under a minute. Fake screen grab of the USA.gov website. Imagine the damage to a person’s reputation should a fake screen grab be shared of an email or tweet. We see these on Facebook all the time, and we are all too quick to believe and share. From time to time I see a shared post on Facebook showing a cctv image of an alleged thief with a headline “Share this so we can catch these shoplifters!” Before you re-share, remember the following: You have no idea where the image originated or if it’s been manipulated. Or it could just be an internet troll causing trouble. If it’s a direct post from a ‘friend’, then it’s relatively easy to get in touch with them to verify. If it’s a shared post, that can be a lot more difficult, so I usually will not share unless I can verify its authenticity. It may come as a surprise that the technology for manipulating images is improving so rapidly that it seems we’re actually getting worse at detecting altered or fake photographs. If the artist is an expert, it can be virtually impossible to detect if an image is fake. Knowing full well what is capable in image manipulation, I usually take the position that an image may not be authentic and go from there. To determine a photographer or an origin of a photo, the most obvious, and often the most efficient way to do it, is to contact the person who uploaded the photo or sent it to an editor. Ask if this person made that photo by himself/herself. Also, it is obligatory to try to find this photo with a reverse image search. Google also shows similar images and sometimes it helps to determine if the photo was edited. It is likely that a reference to a high-resolution image would be the original source. You also have to check the person that spreads the information. There are several different tools that can help to gather information about him/her. Though they are mostly designed for US residents, there are also some that will be useful for residents of other countries. For example, Pipl.com looks for “internet trace” of a user, helps to identify him/her and to find photos. You have to enter the name of the person in Latin, and the program will run a search through all American social networks (Facebook, LinkedIn, MySpace). The feature of the program is that it runs a search through deepWeb, finding items that are usually ignored by ordinary search engines and is not normally available for users. An additional useful tool, WebMii (webmii.com), searches the reference with the name of the person and produces the “web visibility” rating, with which you could find out fake accounts. Thanks to this tool everyone can find references to his/her name on international sites. You can also use people.yandex.ru for a search through Runet. The next step is to determine the place, date and approximate time of the photo. The easiest way is to ask the photographer (if he/she is available) or ask him/her to make more photos of that place. Then you should check the given data with the above-mentioned programs. Journalists, who are good in digital photography, will understand numerous characteristics, provided by this program. The most important information for the others is time, place, and the type of a camera. If metadata is not available, you have to examine carefully the picture: license plate numbers, weather conditions, landscape, mode of dress, advertisements, buildings, stores. All these details can help to determine the place and sometimes they could even testify forgery. Fake news and images are everywhere. Magazines, web, social media, news media, even in educational and scientific publications. As Christians, we should be a little more cautious and exercise a little more wisdom and discernment the next time we see an odd or controversial image in the news or on or social media. Take a pause before hitting that share button. You shall not circulate a false report. Do not put your hand with the wicked to be an unrighteous witness. February 2017 Personal Update News Journal.